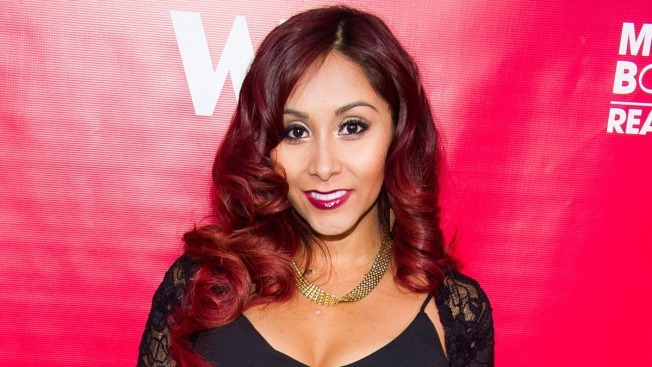 File - In this May 29, 2014 file photo, Nicole "Snooki" Polizzi attends WE tv's "Marriage Boot Camp: Reality Stars" party in New York. Legislation in New Jersey, inspired by former "Jersey Shore" reality TV star Polizzi, says that no more than $10,000 of state money can go to pay speakers at New Jersey's public universities. New Jersey lawmakers have approved legislation inspired by former "Jersey Shore" star Nicole "Snooki" Polizzi to prevent the state's public universities from spending more than $10,000 on speakers. The Democrat-controlled Assembly passed the legislation Thursday. It now goes to the desk of Republican Gov. Chris Christie, who has disparaged the reality TV show as bad for the state's image. Republican Assemblyman John DiMaio says he was inspired to write the measure after Polizzi earned $32,000 to speak at Rutgers in 2011. That was $2,000 more than Nobel prize-winning author Toni Morrison was paid to speak at commencement. MTV's "Jersey Shore" focused on the hard-partying escapades of a group of young Italian-Americans at a shore house and ran from 2009 to 2012. This story has been corrected to show that Polizzi was paid $32,000 to speak at a Rutgers event, but not commencement.